5/20 Cup of Coffee: While the major league club enjoyed a night off, three affiliates were in action, but were only able to win one game between them. The PawSox dropped a close game to the Buffalo Bisons while the Drive were shut out against Lexington. Salem collected the lone win on the night thanks to a Yoan Moncada sacrifice fly in the tenth. After jumping out to a four-run lead in the top of the first, the PawSox were unable to hold on for the win. Allen Craig did most of the damage in that first inning, launching a three-run home run with two outs in the inning. Bryce Brentz drove in the other first-inning run with a single as part of a 1-for-4 performance. Craig, Mike Miller, and Chris Dominguez each collected two hits and Dominguez added an RBI as well. Mike McCarthy took the loss for the PawSox as he surrendered seven runs (six earned) on nine hits and two walks in just 3 ⅓ innings pitched. Mitch Atkins came in out of the bullpen and held the Bisons in check, striking out six and walking just one in 4 ⅔ innings of hitless ball. The Red Sox picked up the system’s lone win on Thursday night. Tied at six heading into the tenth, Bryan Hudson walked with one out and promptly stole second and then took third on a throwing error by Lynchburg’s catcher. With Hudson at third, Yoan Moncada played hero, hitting a sacrifice fly to left to plate the eventual winning run. Moncada finished the game 1 for 3 with two walks and two RBI. Mauricio Dubon and Mike Meyers each contributed two hits while Jordan Procyshen hit three singles and Danny Mars walked three times. On the other side of the ball, Travis Lakins struggled to tame the Hillcats. Through 3 ⅓ innings, Lakins allowed five runs on four hits and two walks, including a two-out, three-run home run in the third inning. Ben Taylor came on in relief and struck out six across 4 ⅓ while being charged with just one earned run. Taylor Grover came on for the final 2 ⅓ and after allowing a hit to the first batter, which scored an inherited runner, shut down Lynchburg for the remainder of the game, striking out three while walking just one. Anderson Espinoza picked up his fourth loss of the season as he was unable to shut down the Legends. Espinoza surrendered three runs in five innings while walking one and striking out four. Anyelo Leclerc and Victor Diaz came on in relief and combined to allow the remaining three runs in four innings pitched. Only five Drive batters collected hits, as their offense was held largely in check by Lexington pitching. Mitchell Gonsolus picked up two hits while Josh Ockimey, Austin Rei, and Joseph Monge each added one. Player of the Night: On a rather lean night for the system, Allen Craig brings home the hardware. 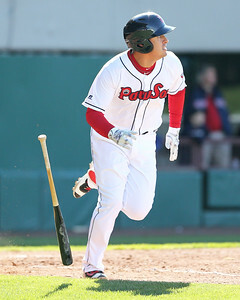 The Pawtucket first baseman went 2 for 2 with a walk while driving in three runs in the top half of the first with his first home run of the year. Craig is hitting .278/.381/.556 across just six games and 18 plate appearances for Pawtucket after spending the better part of the last month on the disabled list.